Soft, sweet, delicious and rich flavored pears (Pyrus) are an impressive source of antioxidants, nutrients and dietary fiber. This widely popular fruit is fat and cholesterol free, and a delicious but healthful snacking choice. Be careful not to throw away the skin of the pear, because the skin of the pear contains at least three times as many phenolic phytonutrients as its flesh and half of the pear’s total dietary fiber. This gift of the gods has more nutrients per calorie than calorie per nutrient and plenty of dietary fiber for your digestive system to works in the way it’s supposed to. Highly refreshing and filling, fresh pears are your healthiest choice and they are going to help you with: diabetes, LDL cholesterol levels, chronic gallbladder disorders, arthritis, gout, colon inflammation, weight management, cardiovascular diseases, digestion, high blood pressure, metabolism, osteoporosis, anemia, bone health and cataracts. 1Before getting into how to determine the pear ripeness you need to know that you cannot judge a pear by the color of its skin because pears ripen from the inside out. The best way to determine ripeness is to gentle pressure pear near the stem and when it gives to gentle pressure, it’s ripe. 2Pears are hypoallergenic, which literally means “less allergenic”, but people who are allergic to Alder (Alnus glutinosa) can be allergic to pears as well. 3Pears ripen best off the tree and if you place them in a paper bag they will ripen even faster. As such pears bought from the supermarket are not always ripe, so leave them at room temperature and enjoy their beauty as they ripen. Pear is one of the more easily digested fruits and as such pear has an important role to play in human digestion. Because pear have around twenty percent of the daily recommended intake of fiber, adding one to your diet is a great and natural way to prevent or remedy digestive problems like diarrhea and loose stool, relieve constipation, or keep you from developing hemorrhoids and colon polyps. Pears are an excellent source of potassium, dietary fiber and antioxidant phytochemicals. Studies have shown that all three of those mentioned above have a significant impact on heart health. Researchers from Johns Hopkins Bloomberg School of Public Health have found that fruits like pears have a protective role in strokes, obstructive lung disease and high blood pressure. Pears are high in fiber and have a low glycemic index, as such they are a great way to satisfy your “sweet tooth” and still protect you from developing type 2 diabetes. Research has shown that certain flavonoids (isorhamnetin, kaempferol and quercetin) in pears may improve insulin sensitivity, which is key for diabetes prevention and treatment. Cut washed and cored pear into cubes, place in a pot and cover with 3 cups of water. 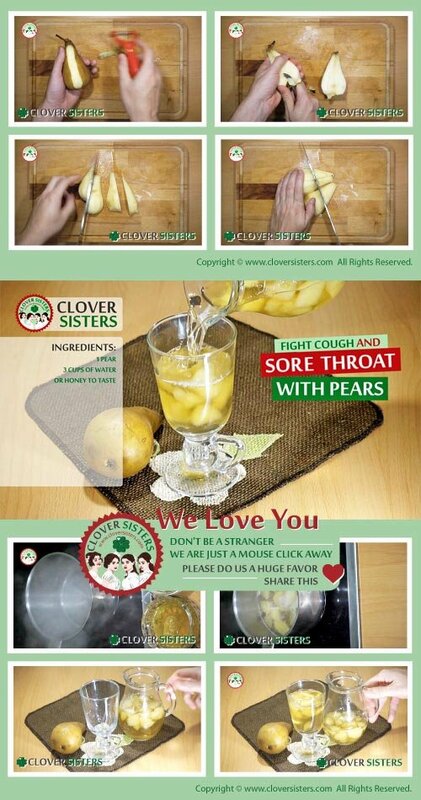 Cook until pear become slightly transparent. Add the sugar or honey to taste and drink warm. It’s very good for children, it’s tastes good and it’s fun to catch pieces of pear in a cup of warm sweet compote.